Don’t Wear Your Gi to the Bar! Did you get your free copy of this ridiculous BJJ book? Pick up a free download of Don’t Wear Your Gi to the Bar! My good friends Marshal D. Carper and Darryl Cozza are letting it all hang out in their newly release book. They tackle important issues like how to talk to your family and coworkers about BJJ (spoiler: Don’t) and how to not be “that guy” at class (you know who we’re talking about). Don’t Wear Your Gi to the Bar marks the first release by Artéchoke Media. Marshal is dedicating himself and Artéchoke to producing Brazilian Jiu-Jitsu books, e-books and videos for real BJJ fans. I hope you’re as excited about that as I am! You may have noticed the BJJ book market has dried up. If you’re sitting on pre-orders for books by Eddie Bravo, BJ Penn or Neil Melanson, you’ve seen a string of release dates come and go. To be fair though, if you’re a mom who wants to raise a gluten-free paleo baby and become a supple leopard before the next Crossfit Games, there’s never been a better time! Marshal has new and exciting ideas for how to approach BJJ books and instructional material, which is why I’m partnering up with him on my first “real” instructional product. 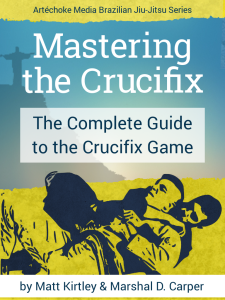 You’ll be hearing more about it in the near future, but you probably already know it’s going to be about the crucifix game. We are aiming to use alternative marketing and distribution models. If you want to be a bro and support Artéchoke’s efforts, you can buy a paperback copy of DWYGTTB on Amazon or CreateSpace and share it with your friends on Facebook, Twitter and PornHub!